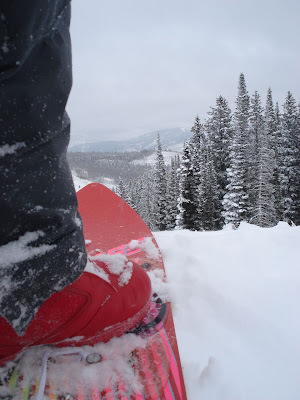 Over the past few of years I have been doing more and more snowboarding without the binding thing. 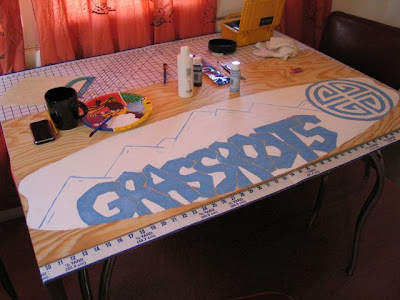 I started off back in ’99 just surfing my split-board since it had grip (the pieces holding the board together, some stomp pads and the teleporters). 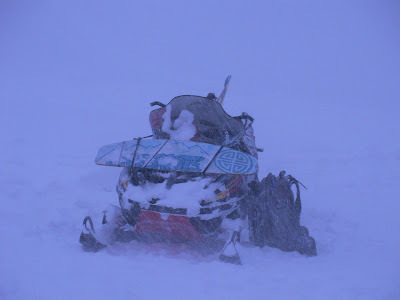 Then came the snowskate which is absolute genius – except you cant ride more than a few inches of pow. 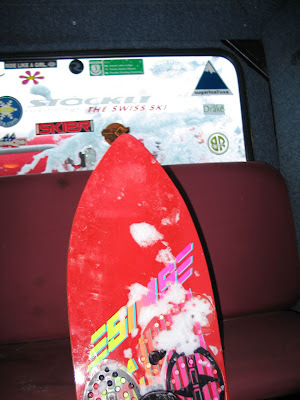 So around 2001-02 Saunders and I broke out the Winterstick roundtail that had nubbies all over the top, a huge fish nose and a skinny round tail- this thing works perfect as a powsurf board. I didn’t have a Winterstick of my own, so I did the next best thing. 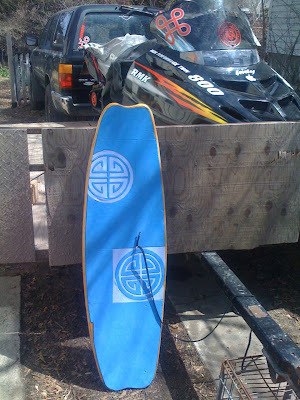 I brought the cut down Sims Blade out of retirement and have been surfing that alot in the past few years. 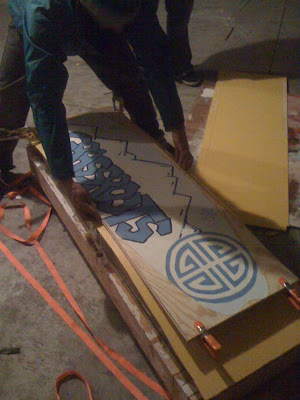 Not the best solution, but it works way better than a regular snowboard. 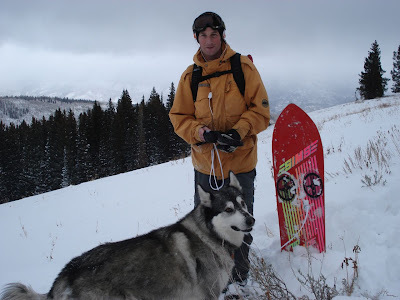 “The Blade”, myself, and the Storm-dog on the first surf mission of 2007. I made some improvements since last season- Leash, and stomppads- grip is everything. 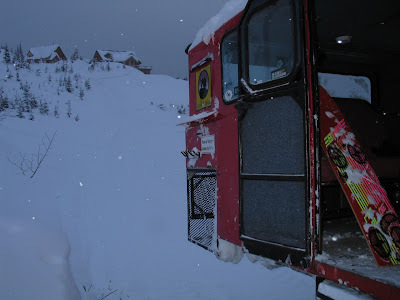 The blade and I enjoyed many deep pow runs via the snowcat at Mica Creek Lodge -Interior B.C. 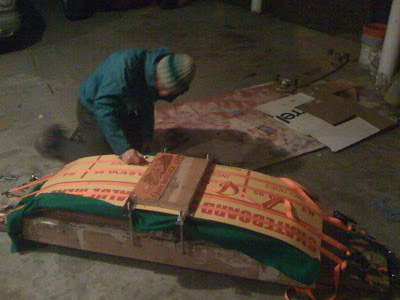 It was pretty fun and fairly functional given the right snow conditions- but It didn’t feel quite right.. it felt like I was forcing it to turn and it seemed too skinny.. dragging toes and heels, etc.. A while back my friend Brock Bitton showed up with a board he had made at his house out of wood, foam, and wax. I took one run on it and and it mad me realize I needed to ditch the whole makeshift snowboard thing and work on shaping a proper board that was designed to work with no bindings. 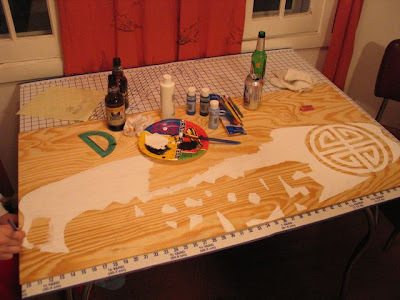 If I made my own, I could experiment with shape, rocker, profiles, etc.. So I got to work. After the paint job dried I pressed it, cut it out, and cherried up the sidewalls. Then gave it a custom diecut grip job. This thing rides like a dream. Brock – running the press – in the a……..factory- yeah our factory. This is pretty much the crew- we are all working together on R&D to make the best board we can. 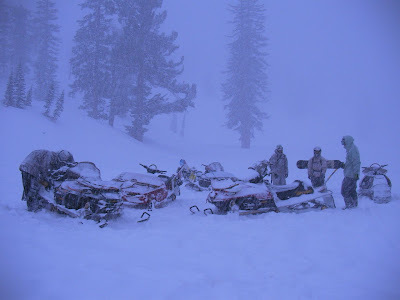 note all the surfboards strapped to the front of our sleds. My board rode so well! 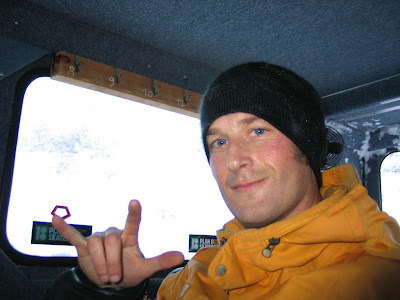 Way beyond the snowboard hack jobs we had all been trying. This could be the beginning of something amazing. 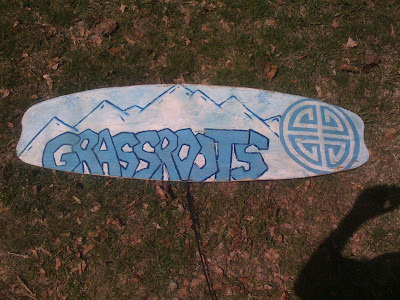 The seed has been planted for Grassroots Powdersurfing! https://www.powsurf.com/wp-content/uploads/2018/09/DropLogo_Horizontal_340x156-300x138.png 0 0 jeremyjensen https://www.powsurf.com/wp-content/uploads/2018/09/DropLogo_Horizontal_340x156-300x138.png jeremyjensen2008-01-17 21:26:002015-09-26 20:57:13Surf's Up!